Ellen, a hypnotherapist, thinks she’s finally found Mr. Right in Patrick. So when Patrick announces that they need to talk, her heart begins to break. He’s not breaking up with her, though – instead, he has a stalker that he needs her to know about. Ellen is fascinated even as she knows the situation should frighten her, especially as things escalate well beyond what she has imagined. I grabbed this book in the airport bookstore, knowing that Moriarty’s writing tends to grip me and not let go. She has a somewhat spotty record with me (loved two, detested one, of her books), so I was hoping this was the right decision. And it was. I thoroughly enjoyed The Hypnotist’s Love Story. It was engaging, the characters were flawed and balanced people, the relationships were strained exactly right by various complications (even beyond the stalker). 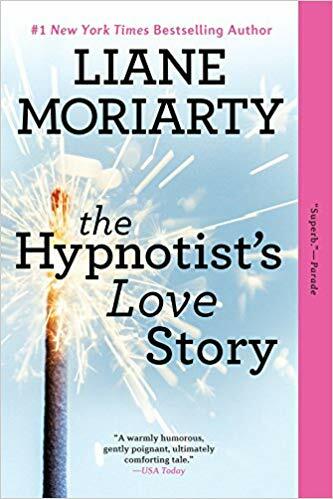 The book showed interesting insight into the mind of a stalker, and I learned some really interesting things about hypnotherapy (which isn’t like stage hypnotism). Throughout, I kept waiting to learn some awful secret that would make my stomach twist the way it did in The Husband’s Secret, but nothing like that happened. The “secrets,” if you could call them that, were simple psychological layers and personal (unnecessary) guilt, and the book was both hopeful and pleasant to read. Satisfying in every way. I’m happy I chose it for my travel companion. This entry was posted in 2018, Adult, Prose and tagged mini-review, psychology. Bookmark the permalink. I’m so glad to read you enjoyed this one! I loved Big Little Lies but even though I think I enjoyed The Husband’s Secret more than you did, I disliked the ending enough that it’s made me hesitant to pick up another of her book. I’ll have to give this one a try! Yeah, it was really the ending of The Husband’s Secret that ruined/tainted the rest of the book for me. But I adored Truly Madly Guilty, so I figured I’d take a chance with this one. I knew that at least it would keep me engaged on the plane regardless of whether I liked it in the end, heh. And it ended up being a very hopeful book, all things considered.